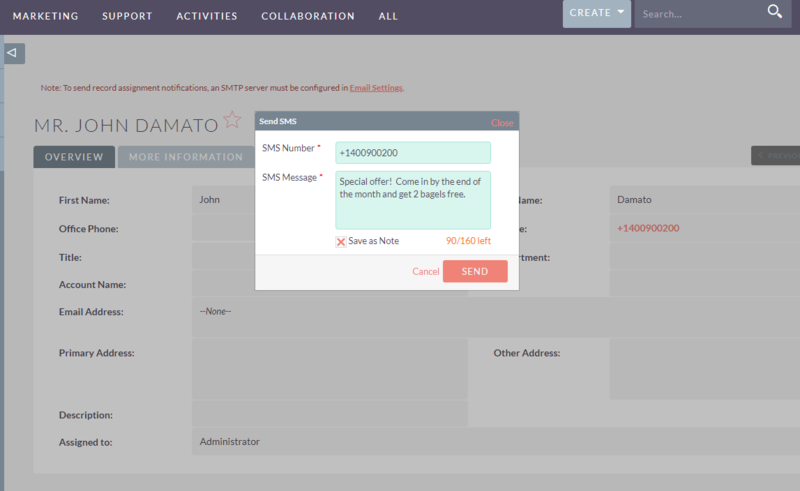 Do you need to send SMS messages from SuiteCRM? SendSMS is the right tool for you. It allows sending SMS with ease to any Contact or Lead or even to many recipients at one time from the List View. SendSMS supports Callfire, Clikatell and Plivo SMS Gateways as well as any custom configuration. Communicate better and faster and improve your marketing efforts with SendSMS. SendSMS is an SMS messaging addon module for SuiteCRM. It supports three messaging services: Callfire, Clikatell and Plivo. It allows sending SMS messages to any Contact or Lead or to many recipients one time from List View. SendSMS works with all versions of SuiteCRM.